Minás Konsolas’ new portraits mix a variety of materials on the canvas – in particular, the vibrant inks with the acrylic paints and oil pastel sticks. 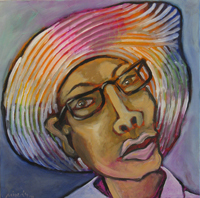 The infusion of bright colors into his formally subdued palette of earth tones draws us into each of these portraits. The translucent inks are little bits of personality peeking out under a pattern of textured, gestural brushstrokes (which, by the way, mimic the corrugated ribs of his cardboard portraits from two years ago). 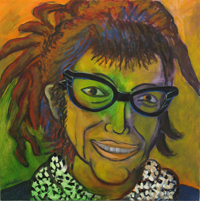 Many of the portraits are known personalities among Baltimore’s artists and the faces seem to socialize with each other, forming a kind of community. There is a transfer of energy between the subject and the artist and the viewer. The triangulation shows us that these paintings are portraits of the artist and the gallery-goer as well. They are not literal, but they are a kind of likeness – personality portraits that are at once representational and enthusiastic. 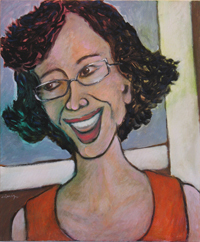 All three amazing women in my portraits are intricate parts of the art community in our town. Theresa Colobus, Theresa's spiritual relation with the past present and future is equally intimate. I wish i had the recipe of how she allows the child in us to be the most vivid characteristic of her personality. Lucky Baltimore, her presence, warmth and caring is a big part of everyone who works with people. She is always in the moment, a cancer survivor.